The boys went outside to play this afternoon. It was so nice. Warmer, no wind and not raining. They were excited to find some of their toys that they have not played with all winter. And then they found it. The huge pond that is in the middle of the driveway. And of course the trucks just had to be driven right through the middle of it. When they came in and took their boots off, there was a huge brown puddle on the floor. Oh well, whats more laundry to do. I have always wanted a pond in my yard, just not in the driveway. I can't believe how much snow is melting. It is like having a lake in the front yard. I think that the ground is still froze so the water doesn't have anywhere to go. I can't complain though, I am anxious for spring to get here, so we will wade through puddles as long as the snow keeps melting. I know that in Idaho it is probably way too early to be excited about spring. I mean we had snow on the ground last year until June, but I am so excited for spring. I can hardly wait. Today it was 50 degrees and there was a lot of melting snow outside which made me even more excited. I could see dirt in some spots and some of the grass where the snow had been pushed back. There is definately a lot of standing water. I can deal with the puddles as long as it warms up. I thought this was so cool. 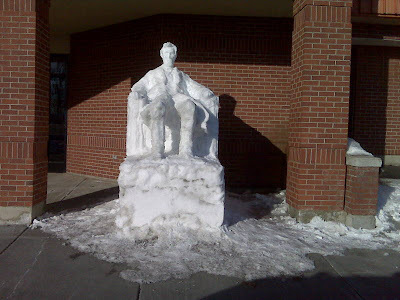 This is at the Hibbard Elementary school in Rexburg. It has been a little warmer during the days so he has melted a little, but I was so impressed that someone had made this.